The exotic Brugmansia suaveolens is a small tree or large evergreen shrub that is cultivated exclusively for its dramatic floral display. A prolific bloomer that may grandly display as many as 100-200 stunningly beautiful flowers at one time under good growing conditions. Simply spectacular… as if presenting rows and rows of chorus line dancers! The enchanting fragrance of their flowers, especially strong in the cool evenings and nights, is an added attraction! These stunning tropical flowering shrubs do thrive in our lowlands though rarely seen. Usually, we get to enjoy these beauties in our highlands. We were delighted indeed to have seen them during our recent holiday to Cameron Highlands in Pahang last month. 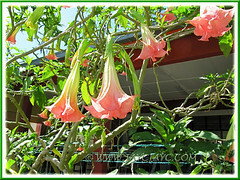 Numerous trumpet-shaped blooms hanging like bells adorned the scrambling shrubs at the Sg. Palas Boh Tea Plantation in Brinchang. It was triple joy as we got to see the gorgeous flowers in three different shades, namely, white, golden yellow and coral pink! Simply fabulous! Though John and I were unable to stop long enough to drink in their beauty then as others in our traveling group may not share our interest, I’m mighty glad to have managed to capture some shots and now able to enjoy them once again as I prepare to share them in this post. We reckon they’re Brugmansia hybrids but have much difficulty in identifying the names as the cultivars run into several hundreds. Based on online images, our calculated guess is that the white coloured cultivar could be ‘Super Nova’ or ‘Brazilian White’, the yellow-coloured, ‘Inca Sun’ and the coral pink, ‘Rhapsody’ or ‘Flirtation’. We’ll stick to these names temporarily rather than use the NOID (no ID) plant status on them. Please holler in your comments if you can correctly ID them for us. Etymology: The genus Brugmansia is named after Sebald Justin Brugmans (1763-1819), a Dutch professor of natural history. The species name suaveolens is derived from the Latin word ‘suave’ meaning ‘sweet’, named thus to allude to the sweet-smelling fragrance of its flowers. Origin: Native to Brazil, Bolivia and Peru in South America but widely cultivated elsewhere. Plant type: An ornamental flowering shrub or small tree. Features: Brugmansia suaveolens is a species of the genus, Brugmansia, that consists of about 20 species and numerous hybrids in cultivation. It is a fast-growing tropical shrub or small tree that may reach 6-15 ft (1.8-4.6 m) tall, with a single-trunk and many thick branches, often forming an umbrella-like canopy. However, some cultivars have an upright growth habit while others may be sprawling. An evergreen perennial with large (up to 10 in or 25.4 cm long) green leaves that are simple, alternate and ovate-lanceolate in shape. 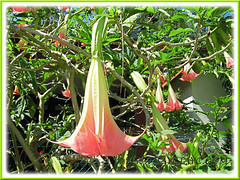 Its most outstanding feature is the showy trumpet-shaped, pendulous or nodding flowers that it bears profusely year round in the tropics. 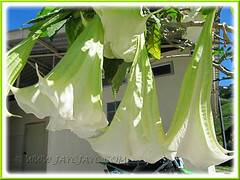 When in full bloom, Angel’s Trumpet is a sight to behold, featuring huge 9-12 inch (22.9-30 cm) long, downward-facing flowers that could number as many as 100-200 at one time. The corolla has five recurved points, some varieties more distinct with longer tendrils than the others. The flowers are usually white, sometimes tinged green or pale yellow, but many hybrids have emerged in cultivation, presenting flowers in varying shades of white, yellow, gold, orange, peach, pink, lilac, red and others in between. Depending on the cultivar, the flowers could be of one colour, two or even three shades and may be single, double or triple flowers. Some will develop the flower color sequentially, changing as it ages. Hence, not at all surprise to see a shrub featuring varying floral colours at any one time. Truly remarkable and to top it off, they emit a nocturnal fragrance that’s intoxicating to enchant you further. Some flowers will eventually develop 10-15 cm long seedpods that contain seeds for propagation. 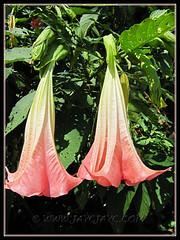 Brugmansia plants were previously included in the genus Datura but taxonomists have reclassified them under the genus Brugmansia. 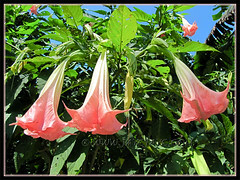 Brugmanias are woody perennials with pendant, non-self-fertile flowers and have spineless fruits, while Datura species are herbaceous annuals or short-lived perennials with erect, self-fertile flowers and produce fruits with spines. 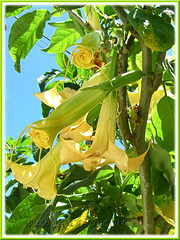 Culture (Care): Angel’s Trumpet grows easily with minimum care. Light: Grows best in full sun, preferably morning sun and followed by filtered sunlight. Can be grown in semi-shade but may not flower as abundantly. Moisture: Medium water requirements. Water regularly, especially during the hot seasons, for best growth and flowering. If soil is dry, it will wilt terribly but will be fine when watered again. Soil: Prefers fertile, moist and well-drained soils, though not so fussy about other types of soil. 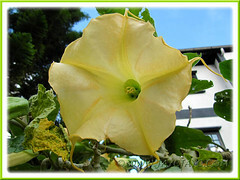 Others: Being fast growers and heavy feeders, Brugmansias are happiest if given regular feeding with a balanced liquid fertilizer once monthly and will reward handsomely with new growth and abundant flowering. Recommended to prune regularly to maintain shape as a small accent tree or a shrub with several spreading stems/branches. Pruning forces it to grow more branches, thereby resulting in more flowers being formed at each new branch. Shelter it from strong wind that may spoil the blooms or break its somewhat brittle branches. No serious insect or disease problems. However, be alert for caterpillars, mealybugs, spider mites and whiteflies. Propagation: Can be propagated from seeds that often start to bloom by the first year, or by cuttings that can be rooted quite easily, or by air layering, a method that is especially reserved for hard to root varieties. Some sources have stated that it’s more reliable to propagate from cuttings as those propagated from seeds may not bloom flowers true to the parent plant. 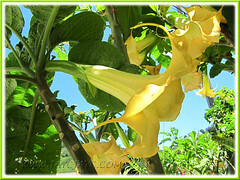 Learn how-to propagate at Brugmansia cubit. 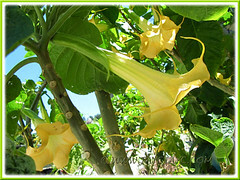 Usage: The exotic Brugmansia suaveolens and its hybrids will make a spectacular specimen or accent shrub in the garden and landscape with its dramatic floral display. Great plant to be used in mixed shrub borders for that wonderful contrast and tropical look. Angel’s Trumpet is ideal too as an ornamental container plant that can be located at sunny spots around the home, patio or deck, and especially good for non-hardy regions where the potted plant could be easily brought indoors during winter. 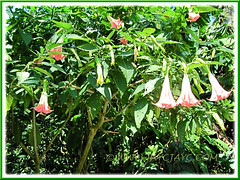 In certain parts of southern Brazil, Peru and elsewhere, the leaves, seeds and flowers of Brugmansia are used in traditional medicine, black magic, shamanistic and religious rituals, etc. 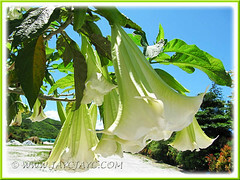 Beware that all parts of Brugmansia suaveolens are poisonous to humans when ingested, especially the leaves and seeds. The toxic principles of the plant are the primary tropane alkaloids hyoscyamine, atropine and scopolamine. It has been used as a hallucinogen with deadly results. Read more about its harmful toxic effects and other uses at The Poison Garden Website and Biopark.org. Brugmansia cubit – enjoy its photo gallery of the various named cultivars and their profile. Dave’s Garden. Do also use its ‘Search plants’ tab to search for Brugmansia suaveolens and be blown over with the several hundreds of named B. hybrids in its pictorial database.